PARSIPPANY, NJ--(Marketwire - July 1, 2010) - Wyndham Hotel Group, a subsidiary of Wyndham Worldwide (NYSE: WYN), has completed the previously announced acquisition of the TRYP hotel brand from Sol Meliá Hotels & Resorts including franchise agreements with 92 TRYP hotels in Europe and South America. The newly renamed TRYP by Wyndham brand joins Wyndham Hotel Group's 11 other brands, which encompass nearly 7,100 hotels and approximately 593,300 rooms in 65 countries. TRYP, a select-service, midpriced brand representing approximately 13,000 rooms, caters to business and leisure travelers in cosmopolitan cities including Madrid, Barcelona, Paris, Lisbon, Frankfurt, Buenos Aires, Sao Paulo and Montevideo. Last month, the brand opened its third hotel in Barcelona, the Tryp Hotel Condal Mar, and anticipates additional openings this year in Lisbon, Berlin, Madrid and Medellin, Colombia. Wyndham Hotel Group President and Chief Executive Officer Eric Danziger said the TRYP by Wyndham brand "significantly increases the company's global presence in Europe and Latin America." "We acquired the TRYP brand because of its strategic presence in major international cities and the significant growth opportunities it presents to our business," said Danziger. "Our immediate focus is to grow the TRYP by Wyndham brand across Europe and the Americas. The latest hotel opening in Barcelona demonstrates the brand's accelerating growth and increasing interest from developers and hotel owners." 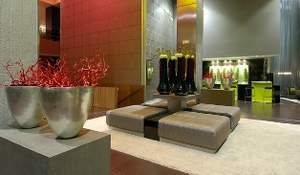 As previously announced, Wyndham Hotel Group and Sol Meliá will work together to develop the TRYP by Wyndham brand globally and expect to market the hotels cooperatively through their central reservations systems and loyalty programs as part of a strategic alliance between the two companies. "This marks the beginning of a promising relationship between two complementary hospitality companies that will foster growth in a vast diversity of regions," said Gabriel Escarrer Jaume, vice chairman and chief executive officer of Sol Meliá. In connection with the closing, Danziger announced the appointment of Daniel del Olmo, as brand senior vice president, TRYP by Wyndham, responsible for its overall business strategy, brand integration, performance, customer relations, service culture, operations and sales and marketing. He will report to Jeff Wagoner, who will continue to serve the company as president of its Wyndham Hotels and Resorts® brand and affiliated Wingate® by Wyndham and Hawthorn Suites® by Wyndham brands. Del Olmo most recently served Wyndham Hotel Group as chief performance officer, leading the development of the company's long-term strategic plan including the development of business strategy and integration plans for the TRYP brand. Since joining the company in 2003, he has served in a variety of roles in marketing, strategy and innovation. He began his career in hospitality in the Americas Division of Sol Meliá Hotels & Resorts where he held various marketing and e-commerce positions. Wyndham Hotel Group encompasses nearly 7,100 hotels and approximately 593,300 rooms in 65 countries under its 11 other hotel brands: Wyndham Hotels and Resorts®, Wingate by Wyndham®, Hawthorn Suites® by Wyndham, Ramada®, Days Inn®, Super 8®, Baymont Inn & Suites®, Microtel Inns & Suites®, Howard Johnson®, Travelodge® and Knights Inn®. All hotels are independently owned and operated excluding certain Wyndham and international Ramada hotels which are managed by an affiliate or through a joint venture partner. Wyndham Hotel Group is based in Parsippany, N.J. Additional information is available at www.wyndhamworldwide.com. Sol Meliá was founded in 1956 in Palma de Mallorca, Spain and is one of the world's largest resort hotel chains, as well as Spain's leading hotel chain in both the business and leisure markets. It currently provides more than 300 hotels in 26 countries on 4 continents under the brands: Gran Meliá, Meliá, ME by Meliá, Innside by Meliá, TRYP, Sol, Paradisus and Sol Meliá Vacation Club. Sol Meliá is the only travel company included in the exclusive "FTSE4GoodIbex" Spanish stock market index and is a signatory of the United Nations Global Compact. In 2008 the company approved its Global Sustainability Policy and in 2009 it was named the first "Biosphere Hotel Company" by the Responsible Tourism Institute, supported by UNESCO. That same year the company was also awarded the Prince Felipe Award for Tourism Excellence for the second time. The company currently employs more than 33,000 people worldwide with staff from over 90 different countries. The company respects equal rights and balance in its contracting of male and female staff and approximately 10% of its workforce is made up of immigrants. For more information, visit www.solmelia.com. EDITORS: High-resolution photos of several TRYP by Wyndham hotels may be downloaded here. Additional photos and logos can be downloaded from the Wyndham Worldwide Media Center, available here. For more information about Wyndham Worldwide Corporation and its businesses, go to www.wyndhamworldwide.com. The Tryp Hotel Condal Mar.